The father-in-law of Mark Hatfield was Vince Kuzmanich. He was a tavern owner, and along with my father, I frequented his Tam' O' Shanty Tavern located on the 900 block of Northeast Dekum Street (just five blocks from my family home), in the 1940's and early 1950's when children were still allowed in taverns. Mark Hatfield often stopped in the "Tam" back in those days to see his future wife who worked there for her father and mother. I accompanied my father to a lot of taverns back in the mid-forties into the early 1950's. 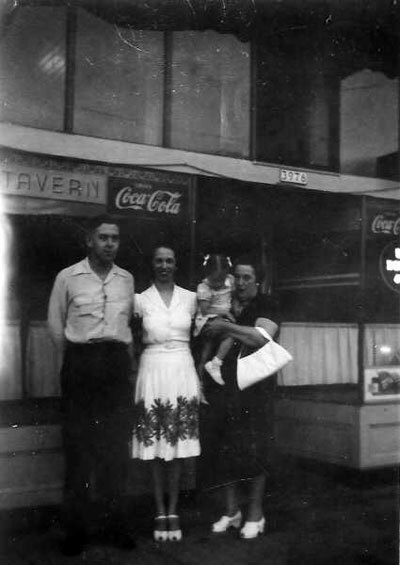 An unidentified couple and a woman holding a child in front of the Wooden Shoe Tavern. Photo courtesy of Vickie Willman Burns. Directly across from what was The Wooden Shoe Tavern was the Yalta Club. South of there, just before Bauers barbershop, was The Midnite Sun Tavern. South of there, near Fremont, was The SOS Tavern. South of there near Knott St. was an upstairs nightclub called The Marenida. A little further south a few blocks and across the street was and still is The Egyptian Tavern. 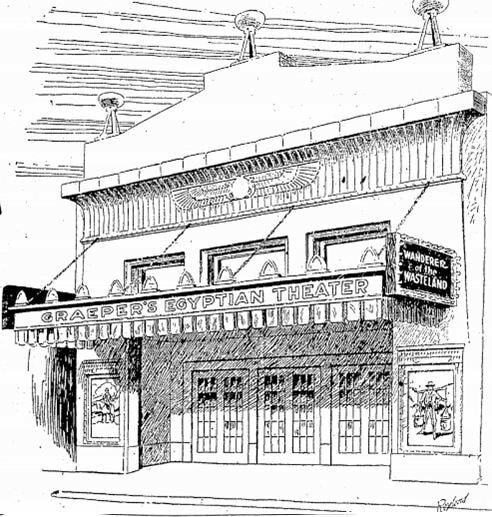 Most likely named after the nearby Egyptian Theater on Union and Russell. There were also two taverns directly across from one another on Alberta Street, just a couple of storefronts east of Union Avenue. I can't exactly remember one of the names, but I do remember that one was called Blackies Tavern. On Union and Portland Blvd. was Spadys Tavern, an Earl Scheib auto paint shop since the early 1960's. Mysterious Billy Smiths was a tavern up until its demise to the Coliseum construction around 1960. It was named after its first owner, a boxer. My father and his boxing cousin Nig Yeager used to frequent that tavern. Also there was The Mississippi Tavern located on Mississippi Street just slightly north of Prescott Street. A Mr. Hohnstein, who was a garbage man, was a onetime owner of the Dekum Tavern located on the corner of Union Avenue and Dekum. My grandfather on my mothers side owned and operated a tavern on Union Avenue in the 1930's just a couple of blocks northeast of Broadway Street. I believe it was called Maries, named after his second wife who tended bar there. Also, there was another tavern nearby The Wooden Shoe called The Silver Dollar. Possibly the same location that later became The Midnite Sun Tavern. Albina and Mississippi Streets both run north and south. However at a juncture, they run into one another near Prescott St. Its kind of like a bend in the road. This also was the location of the Mississippi Tavern. Names of these taverns changed sometimes with new owners. I am sure that there were many more, some off of the beaten path right in residential zones as I recollect having frequented as a child, and then again as a young under aged adult. Written by and used with the permission of Roy Conrad Derring, Portland, Oregon (2016).